During the first few weeks of cookery school we all coveted the shiny new equipment over the pieces that had seen better days; and that included the bread tins. But as the weeks rolled on we began to seek out the most battered and worn tins; experience was teaching us that these ugly little relics were in fact the secrets of a good loaf; no sticking, warping or uneven cooking with these bad boys. From then on the seasoned tin was king and once finished a quick wipe was all that was required prior to next use. Darina Allen later shared the tale of the new cookery school assistant, who wanting to impress, came in early one day to scrub each tin so they shone. I suspect she may not have made it to lunch that day. I had no such tins, that is, until this past Christmas when my mum casually asked if I wanted a couple to take home. She laughed at my enthusiasm but I knew that these puppies were some serious heirlooms; passed down from my grandmother so that’s some 70 years of seasoning. Yes please. And there is a reason for their longevity; these things were built to last. I wonder how many loaves and cakes have passed through these? 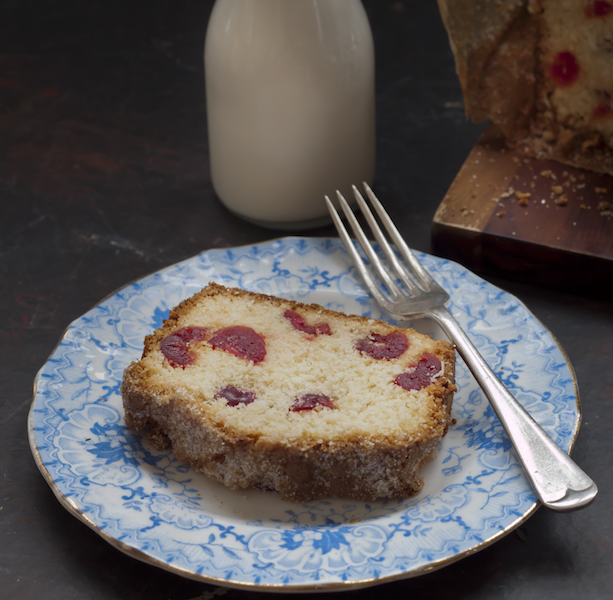 One such cake to be made again and again in these tins is my mothers Cherry and Coconut cake. It is horrendously kitsch with the inclusion of red glace cherries and desiccated coconut but trust me on this one – once you have tasted it you will be converted. 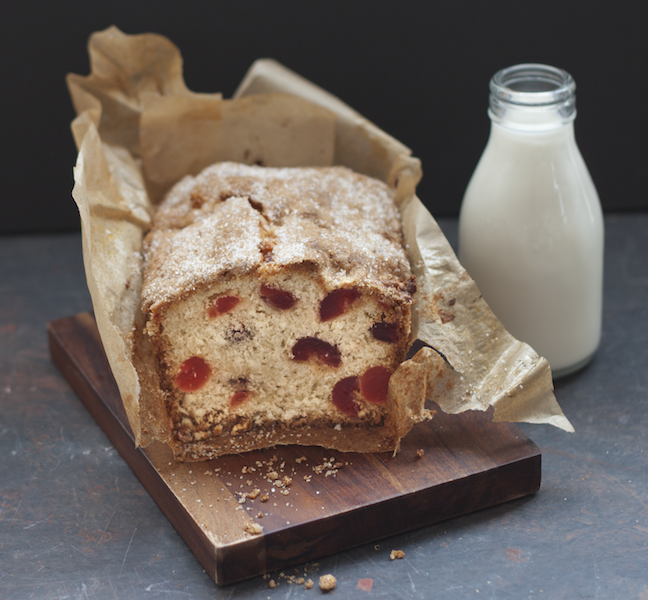 The crust crackles with cooked sugar and a glass of cold milk is the only accompaniment to do this cake justice. This is a hug of a cake. Rub the butter into the flour and add the coconut, sugar and halved cherries. Ensure the cherries are well coated with this dry mixture – this will prevent them from sinking to the bottom of the cake during cooking. Mix the eggs and milk together and add to the dry mixture; the consistency should be a soft drop from a spoon … add a little more milk if required. Tip the mixture into a lined loaf tin, sprinkle with a heaped tablespoon of granulated sugar and cook at 180°C (Fan) for 1 hour and 15 minutes. The cake is cooked when a skewer inserted into the centre of the cake comes out clean.